This seems to the year of little wind. Once again as we got up early to do a weather check, it was let's pack up and paddle. One of the places that we had always liked to visit 30 years ago was Los Dolores. Los Dolores was and still is an oasis along the shore. Back up the arroyo is a mission that was built in the 1600's due to a natural water supply called the ojo de agua or eye of water. A bubbling spring at one time irrigated an orchard of fruit trees. 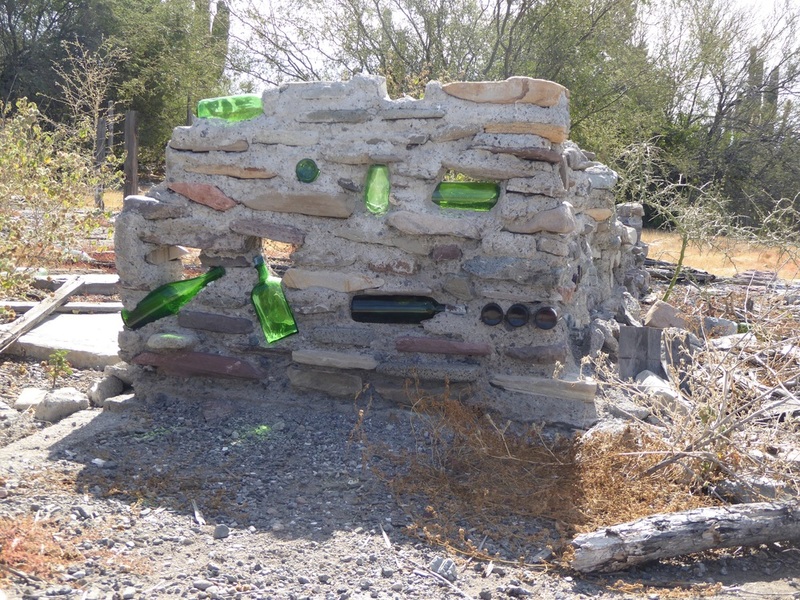 There are only ruins of the mission now, but the irrigation ditches that were carved out of the rock to carry water are still used. A couple lives at the ranch now, raising goats and care taking the ranch. Around the next point is a large house that now controls the access to the arroyo of the mission. We were told that one could ask permission to hike up, but decided to continue on as the weather was still good for paddling. We rounded Punta Nopolo and paddled past a small fishing village. We were ready to make camp and pulled into a beach with a wooden sign. We smiled when we read the sign that stated that this beach was part of a Natural reserve. An organization has bought up some of this coastline and is protecting it from developement. Behind the beach is a beautiful arroyo, too thick to hike thru, but beautiful for a back drop for our camp tonight. Think we will stay here two nights. On the water before sun up is our usual plan. We are treated to the sun rising and shining on the rock formation that indicates the opening to Aqua Verde. The slight breeze that started out the morning has given way to a calm flat day of paddling. We are into our 4th month of paddling and our bodies are in rhythm. We are able to paddle most of the day and enjoy the coastline without needing to be concerned of where to camp due to the wind picking up. A favorite campsite in the eighties still looks the same! On the water again and the memory of this beautiful place is reinforced as we paddle south. 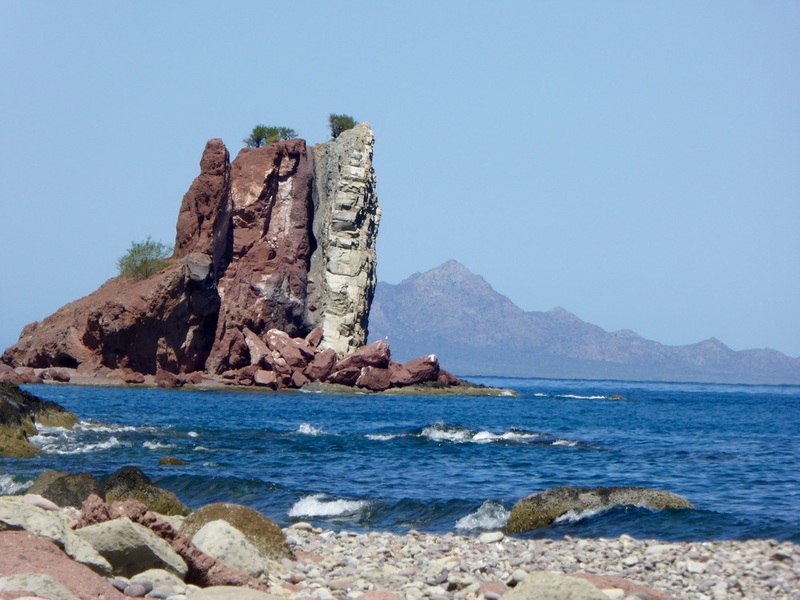 Leaving the populated areas south of Loreto, we are soon into more rugged and isolated beaches. The rock formations and long sandy beaches catch our eyes. It is a gentle breeze that pushes us along. We take several shore breaks and finally choose a camp north of Aqua Verde. We spent the first couple days of March preparing for our next kayaking trip. 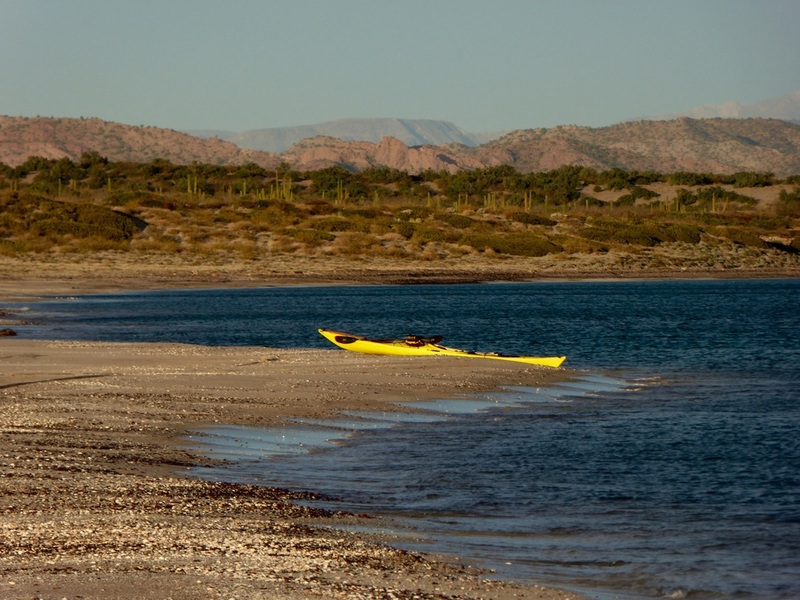 We planned to kayak from south of Loreto to La Paz. 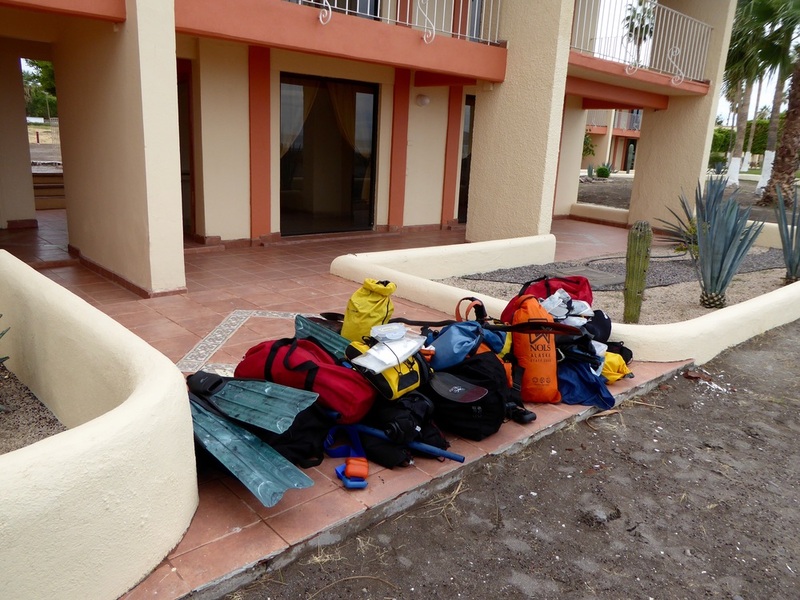 On the second we drove to Loreto, dropped our kayaks and gear at Trudy's and then headed to La Paz. We met up with Patty and Ivan, friends of ours who live in Baja and work in Alaska during the summer.. We spent the day with them checking out some of the places in La Paz. We were able to leave our car and trailer at the kayaking company they work for in La Paz. The kayaking business is located right on the waterfront so if all works as planned we should be able to paddle to the beach, cross the street and get our car. We caught a bus early in the morning on the 4th and by early afternoon we were back in Loreto. We stayed at a hotel near the bus station. The morning of the 5th we were headed to Trudy's to get a ride to Rattlesnake beach. 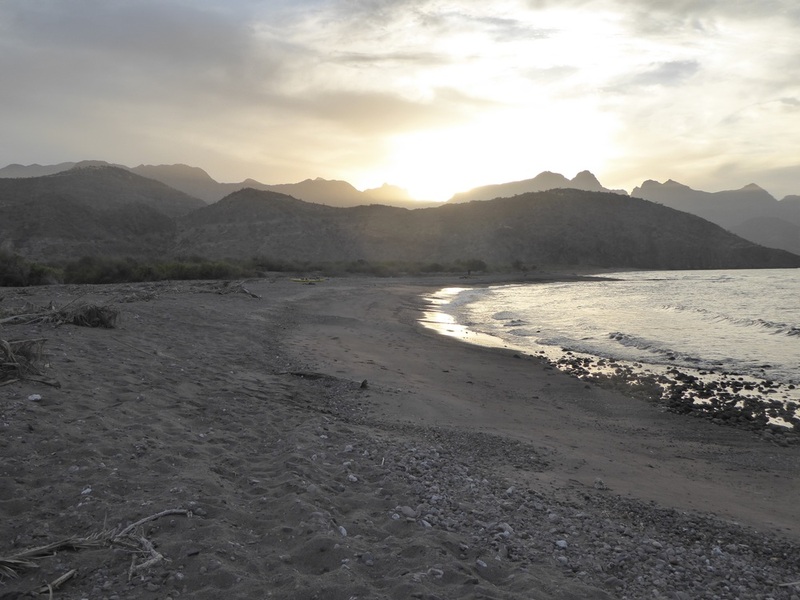 We had already paddled the section of coast from Loreto to this beach in January. There is a lot of developement in this area so did not really want to kayak it again. 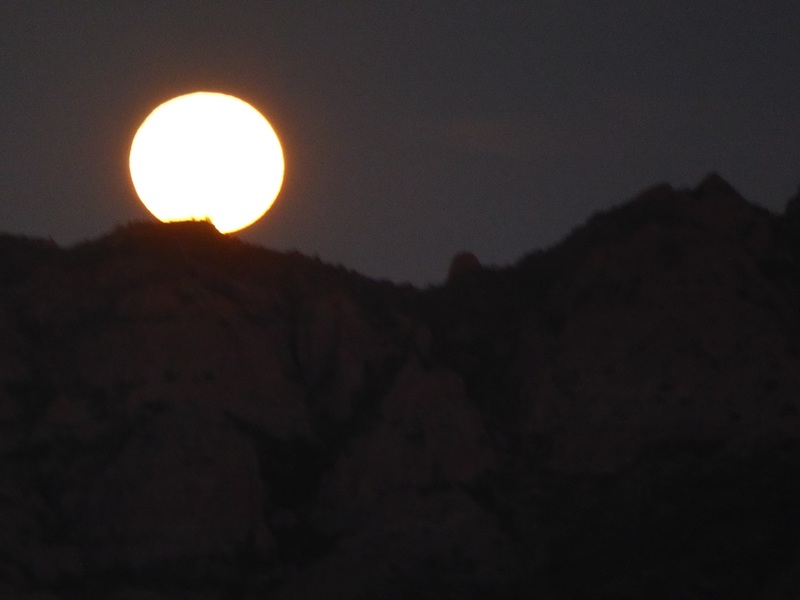 A full moon was scheduled for this night and we were invited to a bonfire, but opted not to go as we planned an early morning departure. It feels good to be back on the water again with our kayaks. 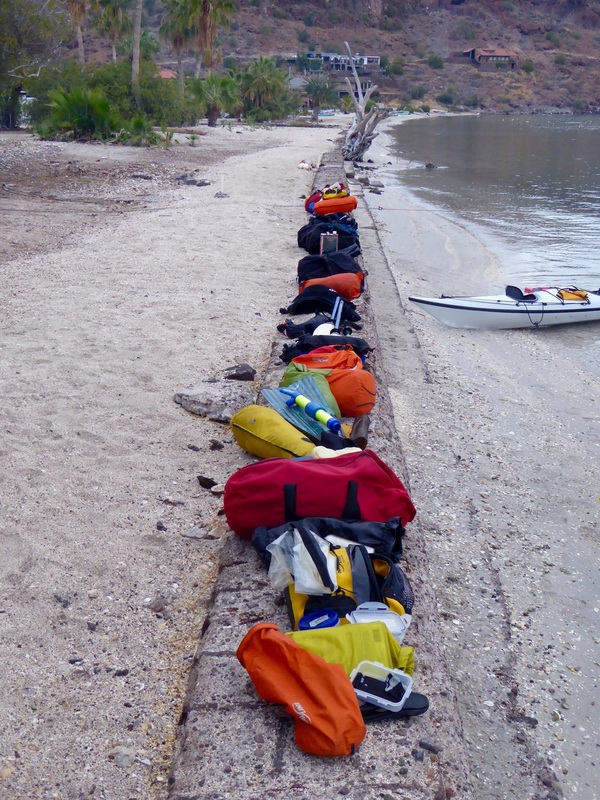 This month we worked a 2 week 23 and older NOLS Mexico sea kayaking course. Our focus was preparing for the course, instructing the course and doing the follow up after the course was over. Needless to say this month was quite busy. We had 9 great students and were sad to see them go. We paddled from Coyote Bay to San Nicolas with a day paddle out to San Antonio to observe the sea lions. One of the highlights of the course was a meal with Chico and celebrating his 79th birthday. 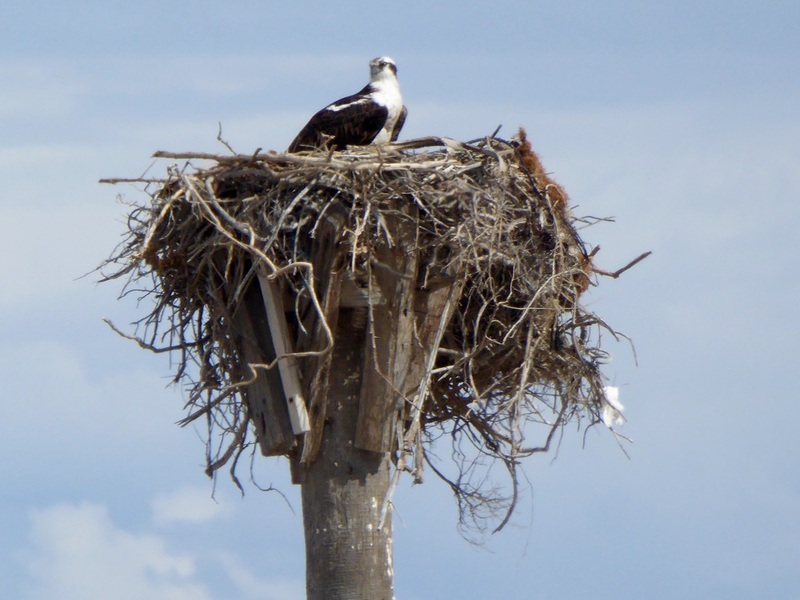 As we left the lagoon this morning, we passed by two interesting items, the first was the numerous platforms built for nesting Ospreys. They were only about 10 feet off the ground. We are assuming that the height is related to the wind storms that occur. Every platform had a nesting bird. The second was the piles of pen shells that were piled as far as one could see. One hopes that they are doing a sustaining harvest. Now it is time to head back to Coyote Bay and prepare for our upcoming NOLS course. 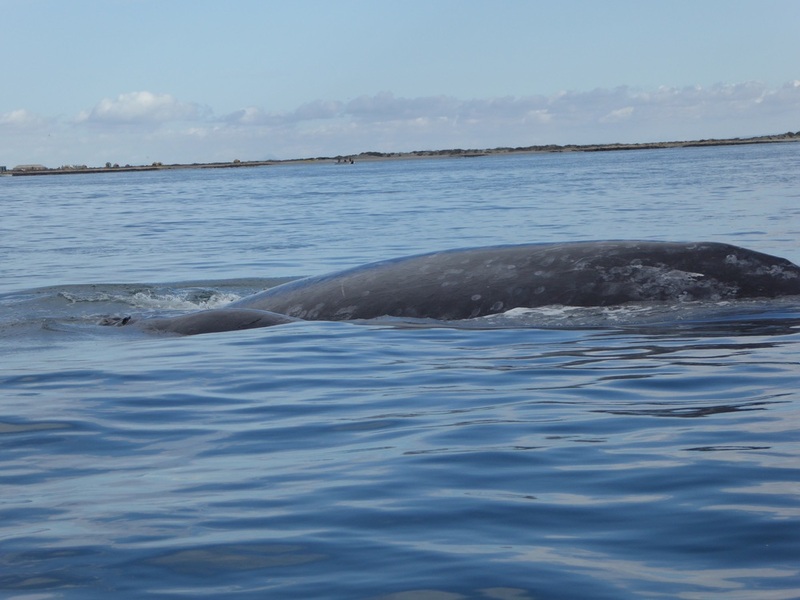 The grey whales are now giving birth to their young in the lagoon at San Ignacio. A friend at NOLS had worked at the company, Kuyima that gave tours to see the whales. In order to observe the whales up close on the water, one needs to hire a guide. We drove to San Ignacio yesterday and made a reservation for today with Kuyima. We met a man camped next to us that spends his vacation here, going out almost every day to see the whales. When he learned that we were going out, he decided to come with us. The morning was overcast, but fortunately the seas were calm. Numerous whales were spouting. Our guide would slowly approach a whale and giving the whale some space, we would sit quietly in the water. Some of the whales would approach us with their newborn. In fact one whale got so close that when it breathed we were covered with moisture. It was a magical day as we observed these creatures of the deep and marveled that many of these whales migrate back and forth from Alaska. It was also interesting to observe the young swimming so close to their mothers and imitating their actions. During our time on the water we observed a flock of cormorants that were flying almost in a single line that seemed to stretch for miles. The afternoon was spent doing a beach walk and birdwatching. Our paddle for this month has come to an end. 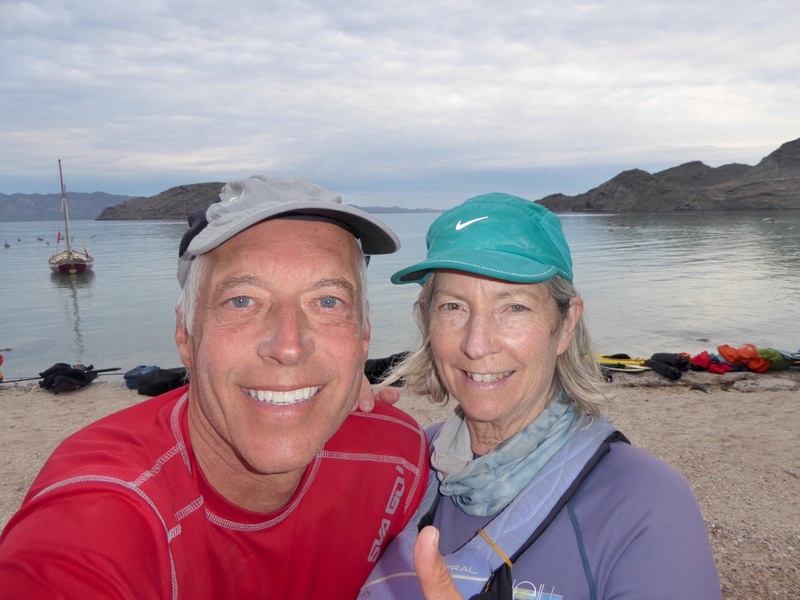 We started at Coyote Bay, and then paddled south to Loreto. 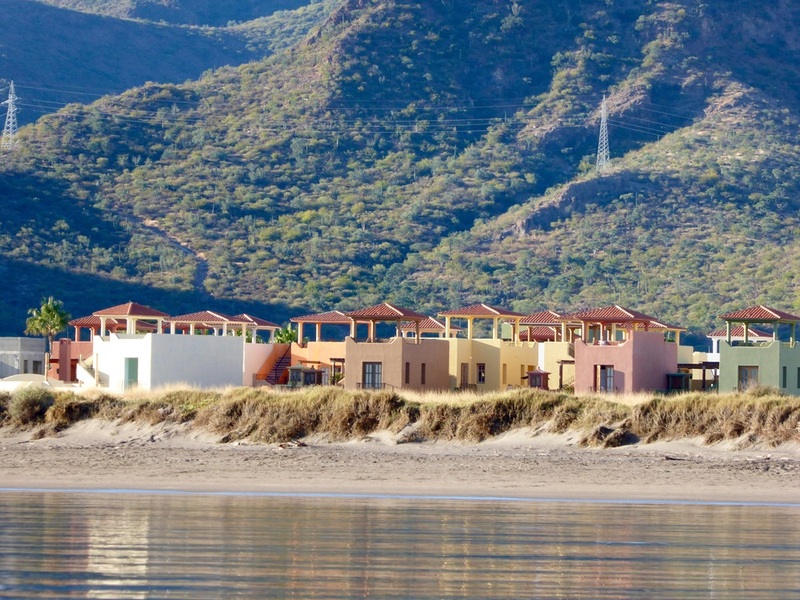 From Loreto we circumnavigated Isla Danzante and Isla Carmen. 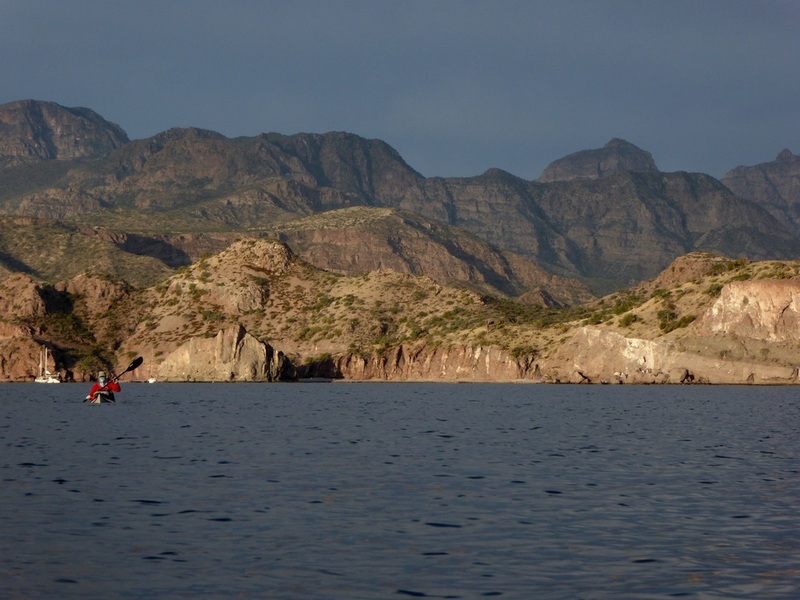 Then it was back to Loreto to continue our paddle back to Coyote bay. Mas y menos we paddled over 200 miles. The weather was quite cooperative with only a couple of wind storms. We felt quite blessed to see this coastline again. The last few days have been spent taking a slow pace back to Coyote Bay. We spent the 26th at Punta Domingo enjoying a long walk behind the beach. Numerous old fences have divided up lots. We wonder if someday there will be a resort here.. Rumor has it that a destination hotel is in the works. From the looks of it now, that hopefully is just a rumor. 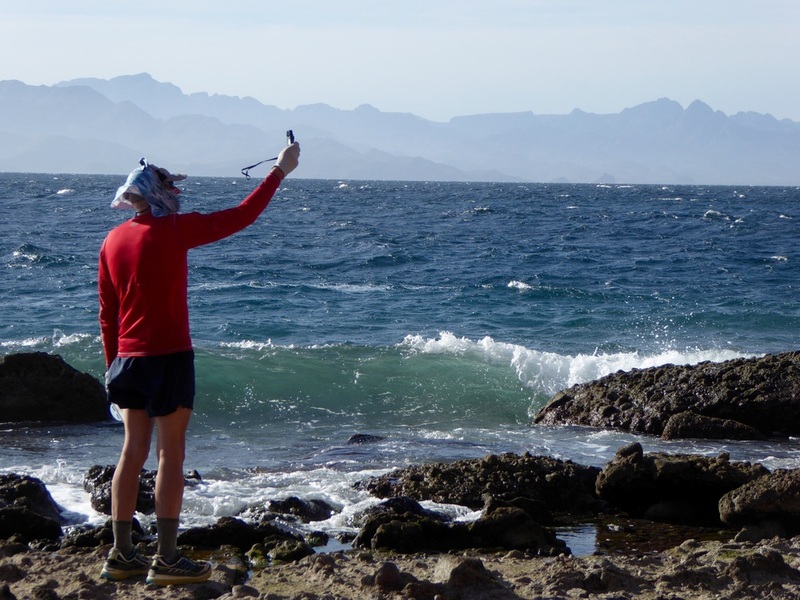 The 27th we paddled a short distance to Punta Beatrice. Here are the house remains of Tequila Dave. At one time a lot of effort went into this location, The dessert is slowly reclaiming this space. A longer walk up a huge arroyo found us in a steep walled canyon. On the 28th we stayed at Isla Coyote and watched large flocks of Brown Pelicans play in the rising air currents. It was a good day to be on the water. The wind continues to die and the swells continue to dissipate. We check out all the fun places to camp as we paddle close to shore. 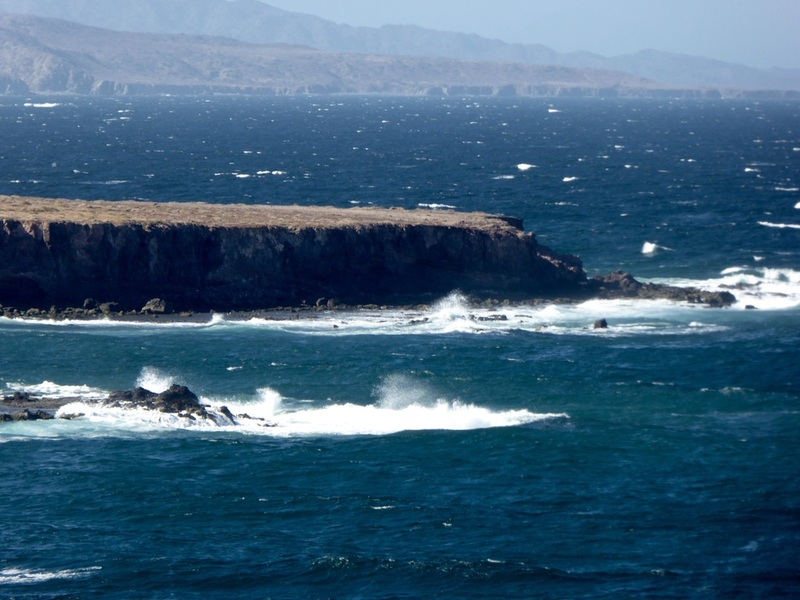 On the trip south several weeks ago the swells were large and all the rocky reefs prevented us from being in close. It is a different place now and we take the opportunity to stop and check out a window in the rocks. We have enjoyed retracing our paddle as we have discovered once more the view can be so different in reverse. We rounded Punta Concepion with small swells and very clear water. Colorful fish swam beneath our boats, darting in and out of the rocks.. We head to Putna Domingo and set up camp. The window to the sea. There was still some wind blowing this morning when we departed. The seas has mellowed some, but the swells were still large. We knew that we could get some protection from the points as we headed north. We were hoping that the wind would not pick up, but knowing we had camping options we proceeded forward.. The points as expected had the largest swells and wind. At San Lino we did a surf landing and took a break. Several houses are now built here and a road can be seen along the coast. 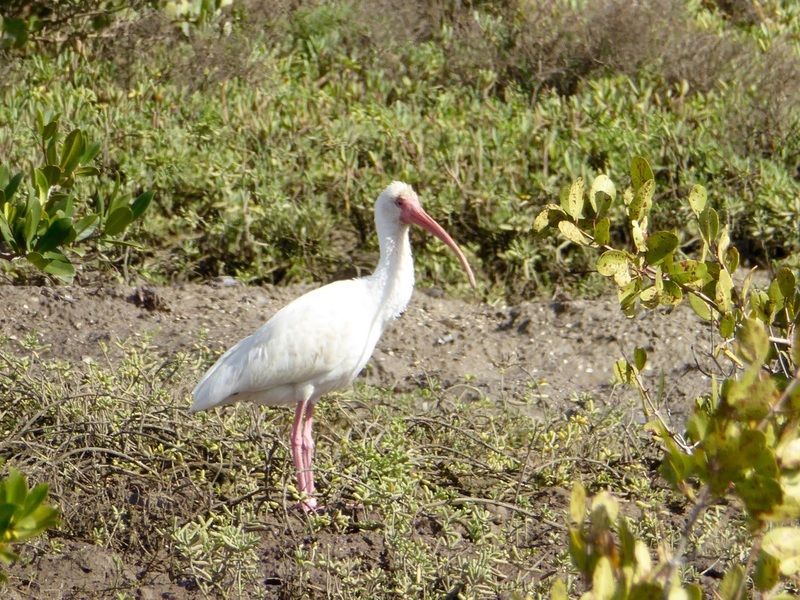 We had been told about one of the houses providing water to kayakers so Don went searching. He met an American who had built one of the houses here. The water gathering was successful. Not that we needed any, but always helps to have a full supply. We can go about 6 or 7 days before needing water.. We decided to load the boats and head to Punta Rosa. We knew once we got around Punts San Lino, we would have some protection from Punta Rosa. Years ago a fishing family had a permanent camp here so we had avoided stopping here. They have moved away, so camping here was an option again. Several palm trees are growing in the arroyo. It is a fairly steep beach to land so we were glad that the tide was high. The clouds were lowering and a rainbow appeared in the sky, not an usual occurance. We felt good about our mileage today considering we were going against the wind and swells. Chico was correct. The north wind started yesterday and continued today. Our tent alerted us to the conditions. We checked out the wind speed using our wind gauge which recorded gusts around 30mph. We would be spending a couple of days here. Not a bad place to explore, and since we have full water, there is no water stress. The tidal pools expose numerous creatures that we had not seen for awhile. One of our favorites are the colorful nudibrachs. Plenty of opportunities to walk up the arroyos as well. A beautiful sand beach to the north also is worth spending time at. We moved our kitchen to a more protected area, but soon were visited by numerous wasps. We finally gave them some water and brown sugar which seemed to draw them away from us. The wind protection for our kitchen was great here, but the wasps were annoying. We will be looking for other options for the next meal. During a long hike thru the desert we managed to see a dessert hare with it huge ears used for cooling its body during the summer heat. We have enjoyed our forced stay here! Left our beach before sunrise and said good morning to the barking sea lions. Our goal was to get to Punta Theresea before the wind picked up. We checked out a whale carcass that was above tide line south of San Nicolas. It's skin was quite hardened by the harsh desert environment. Don headed up to Chicos and returned with water and a bag of oranges. Chico told Don that there would be a strong north wind tomorrow. With that in mind we made steady process to our destination. Arriving there as white caps were forming on the horizon. Feels like the El Norte will be a strong one. We checked out several campsites hoping to find one with some wind break. The tide was out so we were able to check out the point. The wind was much stronger there and did not feel like it was going to calm tonight. It has been a busy couple of days since we left Loreto. We have had a couple days of very light wind so paddled most of the day. Only taking shore breaks to stretch out. We stopped at San Bacillio again and enjoyed the beauty once more. We even practiced some rescues and rolling techniques before calling it a day. On the 19th, we left the beach early and headed north. At Las Tinajas , a NOLS sailing course was just starting to pack their sailboats. We stopped for a visit and even gave a short NOLS Baja history to the students They had been doing a lot of rowing, as the winds had not been very strong. They were leaving the beach so we thought we might spend the night there. We hiked up the large arroyo behind the beach, for a mile or more. Turning around and getting back to the beach we decided to see if we could get around Pulpito. The wind had not picked up much and Pulpito can be challenging. Success! We headed into a beach just south of San Antonio. Years ago this had been an extensive sandy beach. If it was the right conditions we always enjoyed stopping . The beach was fun to explore. In fact one year we experienced sea turtles hatching and making their way to the sea. The point at one time could almost always guarantee a fish for a meal. Not so now, a group of sea lions have taken up residence. It is not a good idea to dive or swim near the point. A house has also been built in the middle of the beach. The beach is now more rock than sand. Changes! We still, however, have many fond memories of this place. Don finds a beautiful cowrie shell as he is doing the dishes. Tomorrow we plan on making a stop at San Nicolas for water and then try to make it to Punta Theresea. The weather feels like the wind will be visiting us soon. 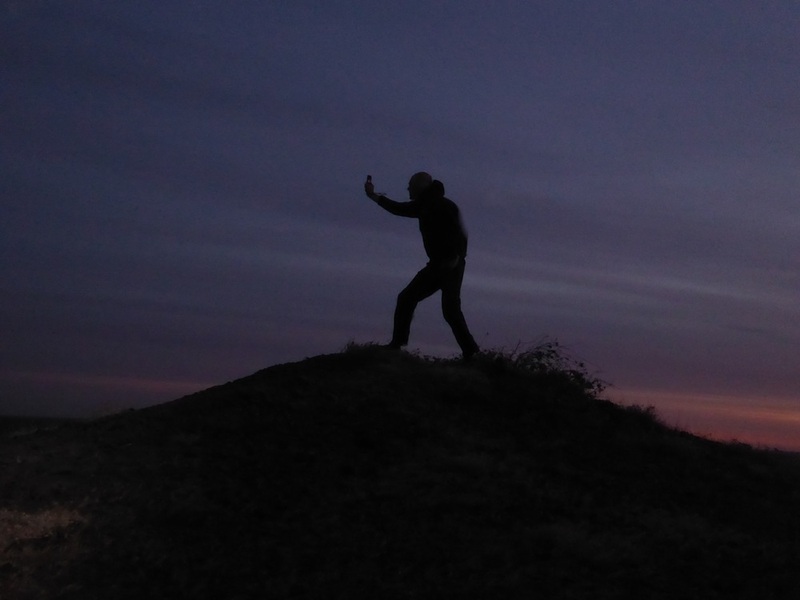 The skies were overcast when the first light appeared. The seas were calm, quite the contrast from yesterday. 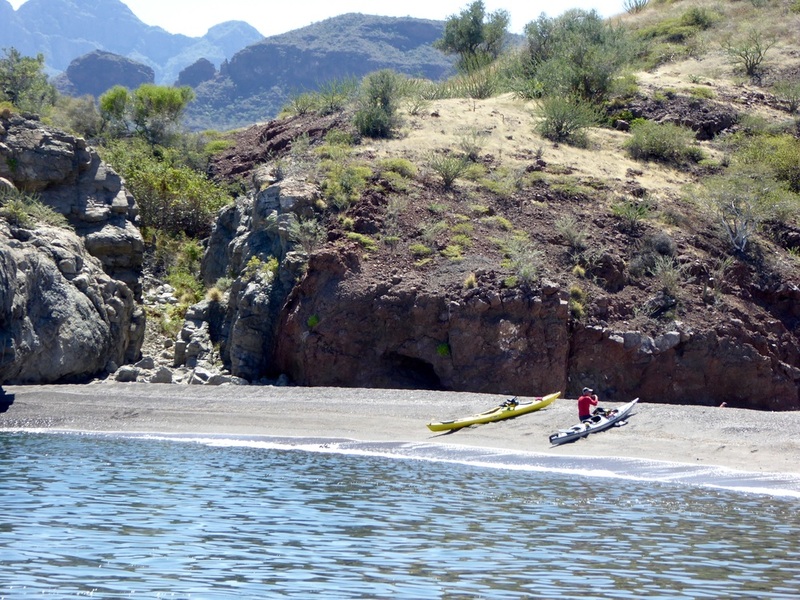 The kayaks were loaded quickly and soon we were headed across the water to Loreto. Some rain even fell briefly. Plenty of fog filled the valleys.. We retraced our path , but going in a different direction brings new view points.It was great to visit an area that was close to Loreto and had very little development. We even managed to paddle close to a blue footed Booby. He must have been high on the the breeding chain as his feet were a vibrant blue. We paddled past the main part of Loreto and stopped at the Dessert Inn once again. Errands were the same as last time and soon we were planning our return to Coyote Bay. It is not usual to paddle North this time of year, but we were going to try. We will start out in the morning. We were glad to be around the Northern shore of the island. A friend from NOLS had been texting us a weather forecast, not always accurate, but another tool to help make a decision. The forecast indicated that a Norte(a wind storm) was approaching. With that in mind we decided to do a short paddle north to where we had seen a sailboat. There is always a good possibility that we could ask for some water, that would give us a couple more days on the island if we could not cross. The sailors were able to fill up one of our water containers and also warned us of the upcoming windstorm. We turned our boats around and headed south with the wind pushing as it built. At times we were surfing the waves, which is fun, and keeps one quite focused. We saw a site that provided some protection and with more white caps appearing, decided perhaps we had paddled enough today. 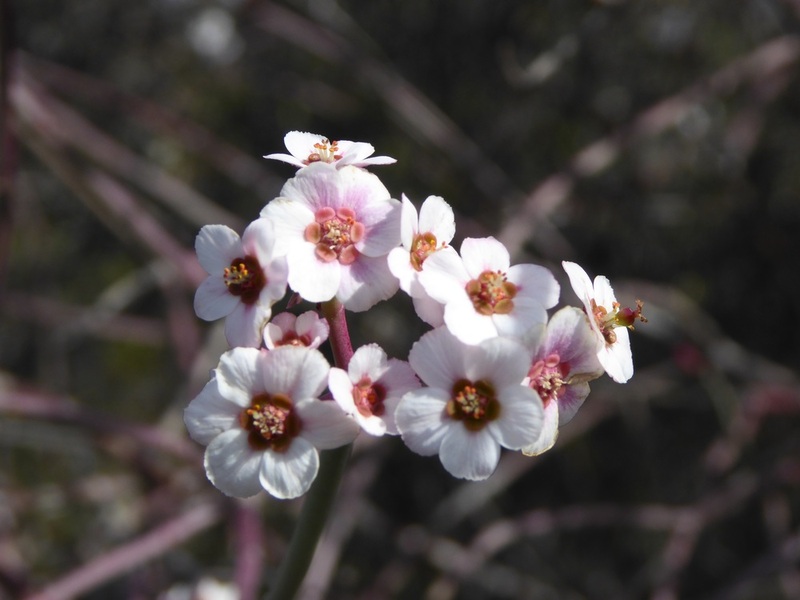 A short hike up an arroyo brought an unique cardon forest. Don checking wind speed. Staying on the beach! The wind died some during the night, and we were able to get off the beach doing a surf launch. As the sun came up we found ourselves paddling against a strong head wind. At times we were essentiallly maintaining our positions, especially when the gusts would come. We paddled close to the shore taking advantage of any wind break. 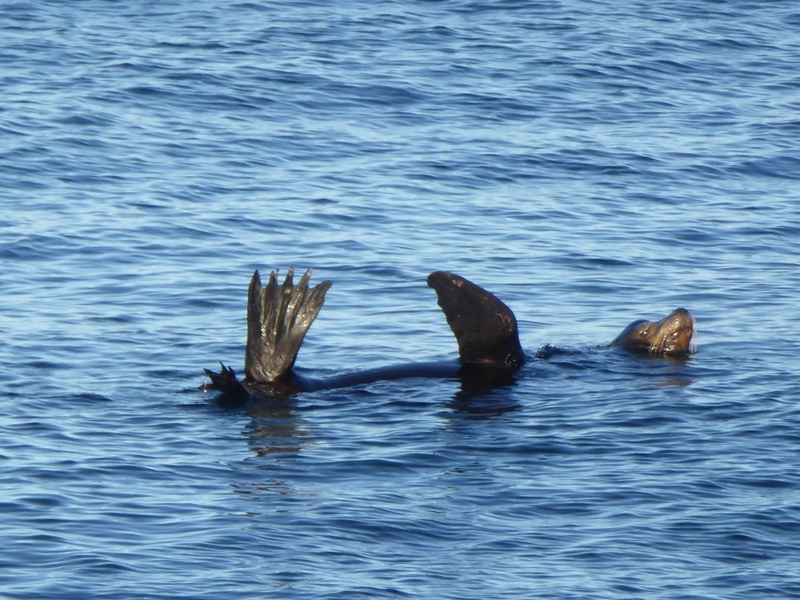 One point that we rounded had numerous sea lions that greeted us with their barkings. Finally the wind died, but the swells were huge. We would disappear from each other when we were in the trough of the wave. A site that has been reccomended to us on this northern shore was a sandy beach with cliffs on both sides. We had to do a surf landing when it appeared but we're glad to be on shore. The wind had picked up again so we decided to make pizza and see if it would become calmer later. Fortunately it did and we were able to round the last point and head south on the Eastern side. We made camp, took a short walk and saw a Big Horn Sheep on the hillside. It was a perfect ending to the day. It was a long day of paddling yesterday. The wind never did pick up so we found ourselves camping on Isla Carmen last night. A great little beach between two cliffs. Isla Carmen is basically owned by Carlos Sims, a wealthy Mexican. He uses the interior of the island for a hunting area for the Dessert Big horn sheep. On the north west of the island, he has a hunting lodge. Rumor has it that a hunting permit for one of these sheep is 100,000 dollars. Camping is permitted along the shore, signs behind the beach inform us of private property.. Often going out to the islands in January can be challenging due to the North wind. This year the winds have been pretty mellow so far. Knowing that the wind can keep us stranded we are taking advantage of the calm days. 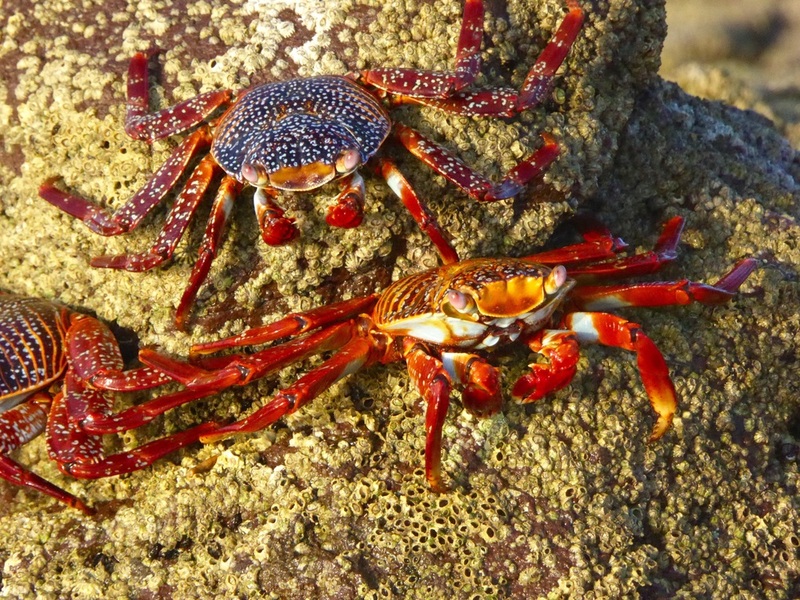 Today we are paddling up the west side, Sally Light foot crabs cover some of the rocks. On one of the beaches is a water tank, that is filled with fresh water coming down from an arroyo. Hiking up the arroyo we find running water and fill a couple of water containers. At a large sandy beach we pull in as the wind started picking up. Further down the beach is the hunting lodge. We put up our tarp and make a hot meal. We plan to stay here unless the wind dies. If it does we will round the point and then try to make camp. The next part of the trip will be totally open to the North. As we are waiting the NOLS sailing seminar appears and pulls into the beach. They are behind schedule as the wind has been weak. We know most of the participants. The wind begins to die some so we quickly load the kayaks and head out. There is still some wind and waves, but we are able to make progress. As the sun begins to set, we do a surf landing and call it a day. It was an easy morning to pack as most things were already packed. We just had to haul everything to the beach front. The roosters were crowing, the dogs barking, morning would happen soon. Not a breathe of air was felt as we put our paddles in the water. Sure seems like we're going to have another day of calm water. As the sun rose it was if we were on a large lake. Love the reflctions in the water. South of Loreto new developments are increasing. Much to our dismay we even paddled by a golf course. A mountain range comes close to the shoreline and we were in awe of the beauty. Soon we were crossing to Isla Danzante. This island is part of the National Parque and permits are needed to camp on the beach. 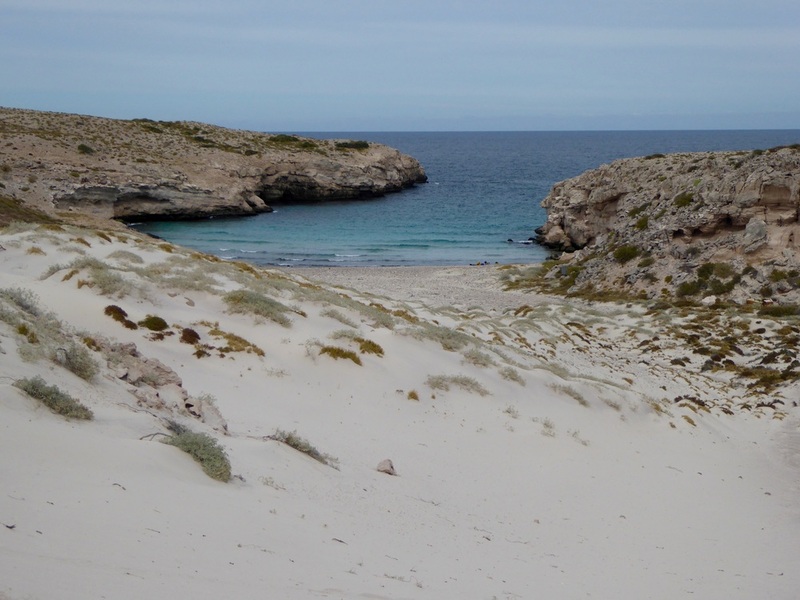 We had planned to camp here, but with the wind remaining calm it was quite enjoyable to meander the shore line and then cross over to Isla Carmen.